Bright as a button today are we? ...Or maybe not? Either way I got one perfect excuse for you to roll up your sleeves and spend 15 minutes to make these cookies weather you want to celebrate an awesome day or pick your self up from a not so good one. The ultimate celebration cookies or comfort cookies! 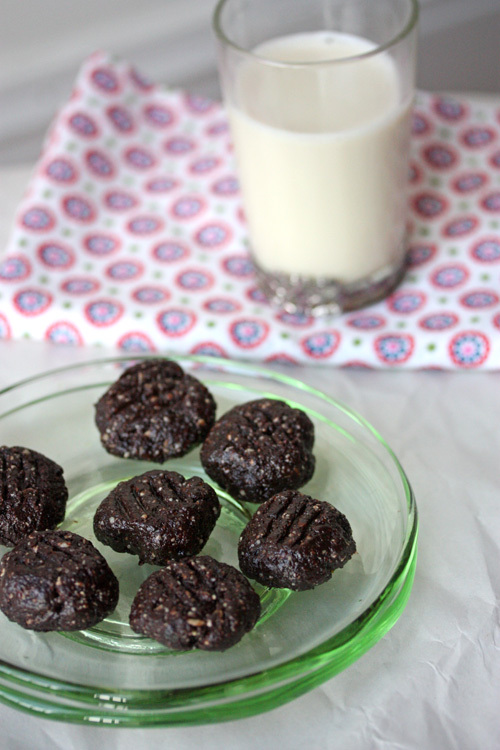 They are chewy, of a cookie dough consistency and full of heavy chocolate flavors. Who can resist that?! Oh yeah, they are healthy too! 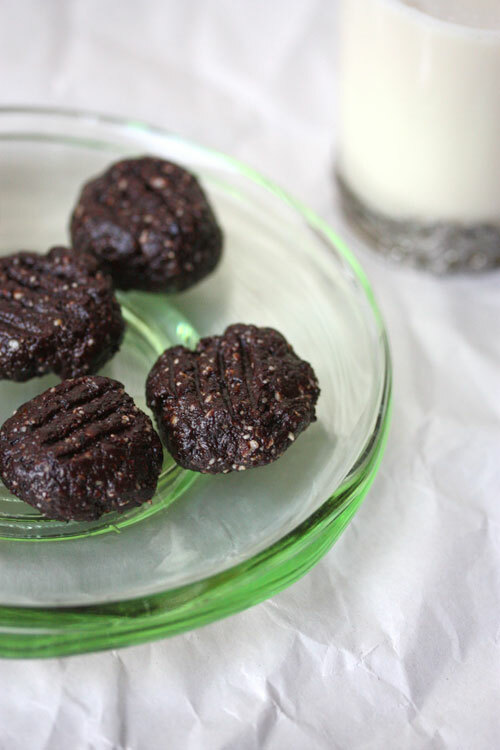 Made of prunes, pumpkin seed flour (that you can easily make), some virgin coconut oil, raw cacao, agave/honey and vanilla - they are easy peasy to make. • Contains a unique phytochemical (plant chemical) called neochlorogenic and chlorogenic acid. These are antioxidants that are damage-preventing, neutralizing a particularly dangerous oxygen radical. Prunes also prevent oxygen-based damage to fats. Since our cell membranes and brain cells consists of fat you can image the importance of the these antioxidants. • Prunes are full of beta-carotene (vitamin A). Just a quarter of a cup will give you 17% of the daily need of vitamin A. So this recipe gives you nearly 70% or your daily need for vitamin A. Vitamin A promotes a beautiful, clear skin and healthy complexion. It also helps preventing wrinkles and acne. Beta-carotene has been shown in studies to be helpful to prevent a variety of diseases like atherosclerosis, diabetic heart disease and colon cancer, it is also useful for reducing inflammatory conditions like asthma, osteoarthritis and rheumatoid arthritis. • Prunes are rich in potassium. The mineral that is needed for bone health and mental stability. 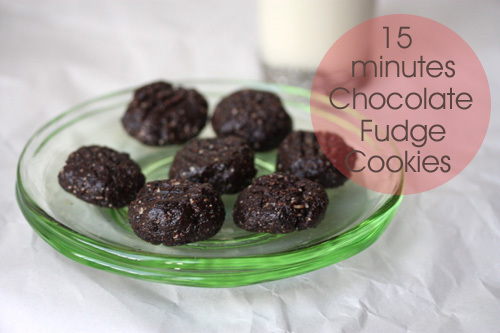 The "15 minutes Chocolate Fudge Cookie" recipe gives you 35% of your daily need of potassium. • Fibre! Prunes contain water soluble fibers, that helps normalize blood sugar = temper and energy, prolonging the feeling of satiety = helps in weight loss. They also prevent constipation = detoxifying. Eating high water-soluble fibre foods like prunes, figs, nuts, flax, fruits, psyllium) helps prevent heart disease and a study involving older women showed a 34% reduction in breast cancer risk for those consuming the most water soluble fruit fibers. • Friendly bacteria. Prunes provides nutrition for the friendly bacteria in the large intestine that is needed for a healthy colon. Healthy colon means beautiful skin and better immune system. • Prunes increase the absorption of iron. Grind the Pumpkin seeds into a fine flour in a coffee grinder or blender. Put aside in a bowl. To the bowl add the dry ingredients (Cacao, Salt and Vanilla and stir by hand.) Add the moist Prunes to a food processor and process until you have a "prune-paste". Put the paste in the bowl with the dry ingredients and add the Coconut oil and Honey/Agave to the bowl and start massaging with your hands until you have a dough ball. Roll small balls of the dough, flatten them into patties and use a fork to make stripes. Eat them as they are or put them in the fridge to eat them cold. Börja med att göra ett fint mjöl av Pumpakärnorna. Häll mjölet i en skål och ställ åt sidan. Tillsätt till skålen resten av de torra ingredienserna (Kakaon, Vanilj och Salt). Rör om noga med en sked så det blandas. Tillsätt Katrinplommonen till matberedaren och processa tills du har en "pasta". Lägg pastan i skålen med de torra ingredienserna och tillsätt Cocosoljan och Agaven / honungen. Knåda ihop allt med dina händer och rulla sen till små bollar som du plattar till lätt och drar en gaffel över för att skapa ränder. Ät som de är eller ställ i kylen för att avnjutas kalla. More delicious and fabulous desserts from my favorite raw-chef!!!! Thanks for sharing, my friend!! These look incredible! What a clever dessert idea! Climbing higher and Pecan & Fig bars! Happy 11-11-11 and Chia heart Cookies!